"I've been fortunate to have performed with so many wonderful musicians in the past but I live in the present and it hasn't stopped. I certainly enjoy what I'm doing these days." The consistently intriguing Seven Rays is yet another accomplishment in Jerry Bergonzi's productive and significant career. It finds the great saxophonist reveling in jagged, tightly coiled phrases and steeped in remote harmonic progressions. 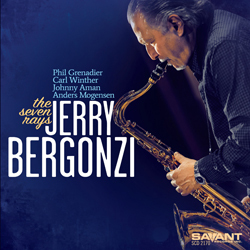 His angular riffs, unexpected silences and big, barreling low pitches continue to underline how personal Bergonzi’s approach to jazz is. Yet the charismatic nature of his delivery and the steely brilliance of his tone proves so compelling that his art speaks eloquently to both the esoteric theoreticians and the most casual of listeners.